Starting from Munich, we reach the austrian border within slightly more than one hour. Past the cities of Kufstein and Wörgl, we follow the Inn valley to Rattenberg, where we are greeted by our Tyrolean tour guide. Together, we will discover the smallest city of Austria during a guided walking tour and visit the Kisslinger glass manufacture. Our next stop is the silver mining city of Schwaz where we can visit the historical silver mines with an English guided tour if you wish. From here, we continue our Tyrol sightseeing tour to Wattens and have a look at the Swarovski Crystal World museum before going to Innsbruck, where our tour guide will take us on a panorama sightseeing tour of Innsbruck combined with a guided walking tour through the old town showing you all of the most important tourist attractions and monuments of Innsbruck. At the end of the day, your driver will take you back to Munich by full size bus, minibus or car, depending on the size of your group. 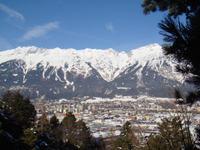 On the way between the tyrolean border and the capital Innsbruck there are many sights and places of interest. Which activities you wish to include in your sightseeing tours to Tyrol and Innsbruck is entirely up to you and depends on how much time you wish to spend for your Tyrol panorama sightseeing tour. For instance, it is possible to include a visit to the picturesque Alpbach valley, a guided tour to Fiecht monastery or a ship cruise on lake Achensee. The staff of the experienced Austria tour operator City Tours would be pleased to assist you and to inform you about possible sightseeing activities in Tyrol and Innsbruck.